Spaceorbeat Properties & Real Estate is group of dynamic youngsters and professionals in Real Estate Industry, Situated in strategic location at Mulund west but has eyes on at all over Mumbai, We SpaceOrbeatians provides services in Real Estate & Properties For Buy, Sale, Lease, Rent, Pre-leased Properties in all over Mumbai. we will provide hassle free documentations. And we're committed to he lp you make wiser property decisions" coz u deserve the best...""
Badlapur is a city in Thane district it encompasses the old villages of Badlapur, Kulgaon, Manjarli, Belavali, Katrap, and many other small villages. The region surrounding Badlapur is mountainous. The Ulhas River flows between Badlapur and Kulgaon. Floods frequently occur due to Badlapur's geographical location near this mountain runoff. Badlapur and Kulgaon are connected by two bridges over the river. The town is well connected to the Mumbai Pune Expressway. NMMT buses are available from Badlapur to Vashi and CBD Belapur/Turbhe Bus Station. Badlapur has auto rickshaw services to reach destinations within Badlapur city. One can find State Transport buses near Badlapur railway station (west). Badlapur is a terminal station for many trains, local to Mumbai, of the Central Railway zone. The majority of the population is Hindu, along with a substantial Muslim community. There are many temples, mosques, and churches in the town. Recently the city has made headlines in the news due to the steepest hikes in real estate values in the locality. Many noted personalities, including filmstars, have shown interest in buying properties here in the vicinity of the scenic Ulhas River valley. Badlapur developing rapidly with new launched projects like Godrej Vihaa by Godrej Properties, projects by Arihant, Tharwani group, Raj Group, Elite Group and etc. Excellent Climate & Availability of Basic Things. Lodha Codename Big Bang is Launching their Phase 1 in 44 Acres of Land Parcel, which will be Concept of township with 70% Open Space for Amenities, Hospital, Lodha World School, Cricket & FootBall Ground in this project. This one is going to be Biggest Pr-Launch Ever in Mumbai with all Positive Aspects in Court. This Launch will be Special as Township with every single things you have ever Dream of will be there at your luxury. Brand, Township, Amenities, Quality & Trusted Developer. Natural beauty meets plush living. This luxurious oasis of peace is enveloped in a blanket of lush landscaping and pure bliss. Conveniently located a short walk away from Nahur station, with quick access to the Eastern Express Highway, a hospital and shopping areas. It is adorned by world-class interior specifications. Other specifications of these abodes are diversified flooring including designer marble and laminated wooden and spacious living and dining area. The floor plan provides balance of luxury and utility. Some of these are reserved parking, swimming pool, games room, football & cricket area, kids play area, garbage disposal at each floor, gym, tennis court, community party area and park. Hi-tech security measures have been used to ensure safety of residents. Access Control, CCTV surveillance and RCC framed structure are some of the security measures used here. Very Costly but value for money. Noisy because, very close to Highway. Address: 212, Shree Samarth Plaza, Opp: Mulund Railway Station, R.R.T Road, Mulund W, Mulund West, Mumbai, Maharashtra, India. 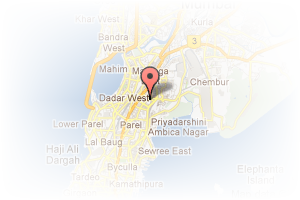 This Broker Profile page for "Space Orbeat Properties" has been created by PropertyWala.com. 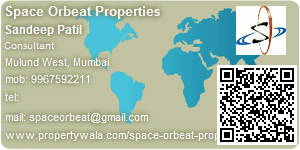 "Space Orbeat Properties" is not endorsed by or affiliated with PropertyWala.com. For questions regarding Broker Profiles on PropertyWala.com please contact us.